According to a World Steel Association report, global crude steel production increased 4.6% last year compared to 2017. Crude steel production increased in every region except the E.U. E.U. production declined 0.3% year over year. Overall, production growth slowed from the 6.3% year-over-year increase in 2017. Global steel production in 2018 reached 1,808.6 million tons (MT). Asia produced approximately 70% of that total at 1,271.1 MT, up 5.6% year over year. China produced the bulk Asian production at 928.3 MT, marking a 6.6% year-over-year increase. China’s piece of the global steel production pie increased from 50.3% in 2017 to 51.3% in 2018. 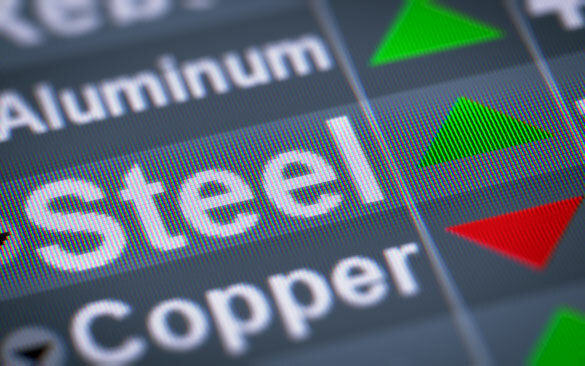 India’s crude steel production jumped 4.9% to 106.5 MT. Of note, India surpassed Japan as the second-largest steel-producing country in the world last year. Japan produced 104.3 MT in 2018, down 0.3% compared to 2017. South Korea produced 72.5 MT of crude steel in 2018, an increase of 2.0% compared to 2017. As mentioned, E.U. production fell 0.3%, down to 168.1 MT of crude steel in 2018. Germany’s production fell 2.0%, down to 42.4 MT. Italian production rose 1.7% to 24.5 MT. France’s production fell 0.7%, while Spain’s production fell 0.1%. North American production hit 120.5 MT, up 4.1%. U.S. steelmakers, buoyed by the Trump administration’s Section 232 action, churned out 86.7 MT, a 6.2% jump from 2017. The Commonwealth of Independent States (CIS) produced 101.3 MT, up 0.3%. Russia produced 71.7 MT of that total, marking a 0.3% year-over-year increase. Ukraine’s production fell 1.1% to 21.1 MT. South America saw its production tick up 1.3% to 44.3 MT. Brazil accounted for 34.7 MT of that total, good for a 1.1% increase. The Middle East produced 38.5 MT of crude steel in 2018, up 11.7% from 2017. Iran accounted for 25.0 MT in 2018, up 17.7%. Turkey’s crude steel production, in what was a tumultuous 2018 for the Turkish steel sector, hit 37.3 MT, down by 0.6%. Amid a diplomatic row with the U.S. over the detention of American pastor Andrew Brunson, in August 2018 the Trump administration doubled its Section 232 tariffs on steel and aluminum vis-a-vis Turkish imports (raising the rates to 50% and 20%, respectively).